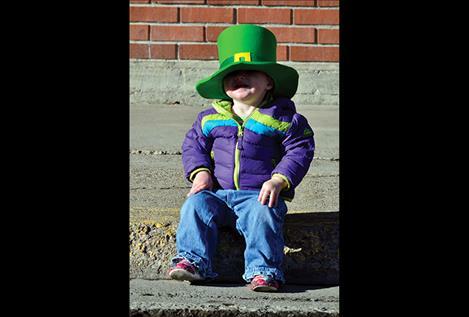 Folks wear green of all sorts for the St. Patrick’s Day parade. Library patrons decorate their parade float. RONAN – The green horse returned again this year in the 27th St. Patrick’s Day parade, although it wasn’t the same green horse seen in years past. 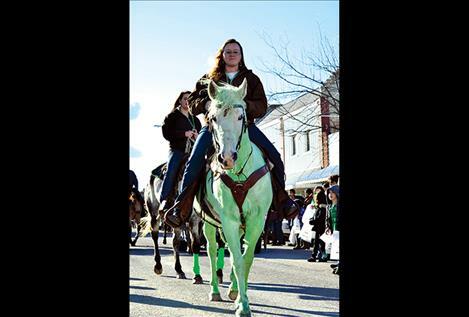 Dennis Palmer started the green horse tradition years ago, and his family continued it when he passed away. This year, Mock picked up the tradition. Mock filled a spray bottle with green food coloring, green Kool-Aid and water to make the shamrock green color. She sprayed the mixture on her white horse named Luna before the parade. “People can eat it, so it’s okay for the horse,” she said of the color mixture. Mock didn’t need to worry about wearing green to keep from getting pinched this year, as the tradition goes, because her hands were solid green after finishing the coloring project. She said gloves might be a good idea for next year. Before the parade, kids at the Ronan Public Library decorated a float with balloons around the library’s green wooden bookworm mascot. This year, about 31 kids rode on the float. 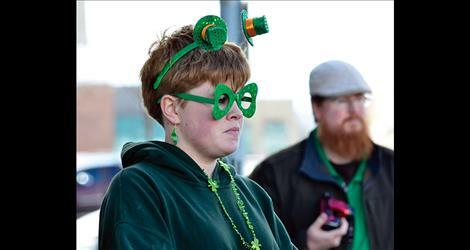 Erin McCrea put on her giant green glasses and headband with the little green hats bobbing from it. She helped make sure each child was wearing something green. As a teen, she has also been working on establishing a teen advisory group with the library. 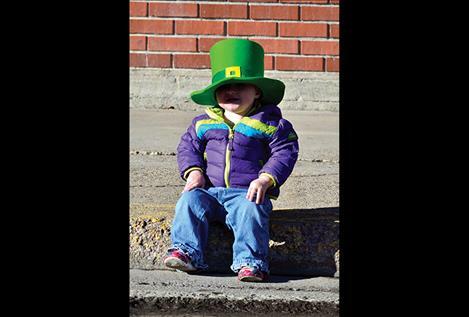 Carlene Bockman helped organize the first St. Patrick’s Day parade in 1985. “We decided to raise the Irish flag for something fun to do in March,” she said. The surprise winter snow storm that fell the morning of the parade didn’t cause any problems. The snow was mostly melted off by the 5:30 p.m. parade time, although it was a bit chilly out. Bockman said that the Ronan Irish Community would like to thank everyone for attending the parade from the spectators to the parade contestants. 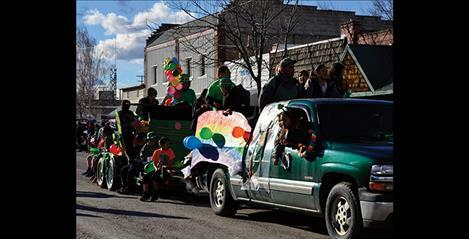 The winners in this year’s parade: “Best Kids Float” went to O’Leary’s Old Ladies. The “Most Irish Animal” went to the Templers. The “Best Walkers” were Amy & Savannah’s Lucky Charms. “Best First Timer” was the Rainbow Float. The “Most Irish” went to the Pheasant Lounge. The “Most Likely to Cause a Riot” was the Honor Guard. The “Greenest” went to the Green Horse. 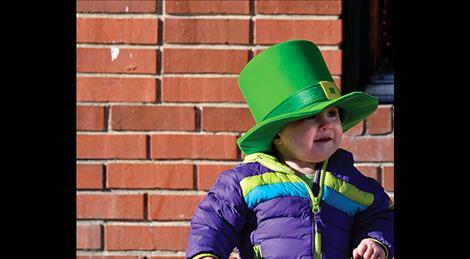 The “Best Irish Attire” was given to Knights of Columbus. The “Most Shamrocks” also went to the Pheasant Lounge. The “Most Likely to Spend the Night in Jail” went to the Pioneer Days, and the “Overall Best Float” went to the Valley Club Bar and Café.